People are always asking me what I think about Cesar Millan. 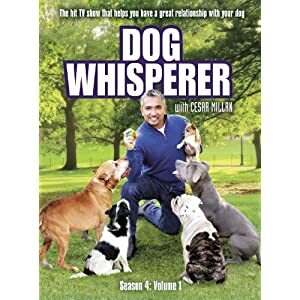 He's the star to the controversial, yet often popular Dog Whisperer TV Show. Airing on the National Geographic Channel on Friday nights, Cesar has won many fans among owners, and at the same time, many opponents in the dog training world. I'm no dog trainer. Yes, I train my own dogs. I'm a DIYer at heart. But that doesn't make me an expert on all breeds, behaviors and techniques. Over the years, I have attended traditional treat-based training classes many times. They work when the owner is diligent. I had the opportunity to try a Barkbusters class with Tanner and learned a bit about their no-treat techniques. This was all well and good fur us, yet may not have worked for a puppy. At the time, Tanner and Oliver were both beyond that first year of basic commands, and in the process of getting their coveted CGC certifications. I also enjoy immersing myself in Cesar's calm attitude. Do I think his approach will work for everyone? Absolutely not! I do think that most owners could learn a thing or two about their own behavior around their dogs. That's where I believe Cesar is setting a good example. His trademark "Ch" correction noise was met with little more than a miff by my pups, but the Barkbusters "Bah!" was ever more effective. I think each dog and owner need to continue learning and trying new methods throughout the dog's life. I found that new methods brought out a younger Xena, when during her 13th year she began to learn new skills I would never have believed possible had I not seen it for myself. I just changed the way I presented the task, and viola', Xena performed. For what it's worth, Cesar has a lot of good philosophies and attitudes to share. If you're interested in garnering what you can from his methods, I invite you to enter to win the Season 4: Volume 1 5 DVD set. If you're not into playing the odds, click the link and you can easily order your own package for the going rate at Amazon--about $18.00 as I write this. Please note that this giveaway will run for 2 weeks. You may enter by some methods daily if you wish; however, only the 2 mandatory entries are required to qualify you for the drawing. If you do not see the Rafflecopter entry form below, simply click on the post title to refresh and it should appear hear in seconds. Good luck! As Cesar would say, stay calm and assertive. Full disclosure: This DVD package was acquired by me and is being offered as a promotional event. No purchase is necessary to enter. The above does not constitute a product review, but merely a sharing of some observations about various training and dog handling methods. Please read more about my contest and giveaway rules here. There is no doubt that Cesar has many good philosophies about dog training. I may not agree with every method but I agree with most. I remember reading Cesar's book when I was in high school. I loved it. I may not agree with every method, dog training is difficult especially with six and 3 other people not listening to me and being cooperative, but I do try my best. I think I like the lady from It's Me or the Dog better. She is more agreeable and easier to get along with, I think. I have always been a fan of Cesar. Since the first episode I watched I was hooked. I hope to be able to gain the knowledge, skill and know how or dog behaviors so that ultimately I am able to open a pit bull rescue/rehabilitation center. Hahah! That’s true Cesar does have a calm attitude; he’s like a 60’s mellow hippie. I think he makes dogs at ease around him which contrasts well when he needs to be authoritative. I started watching this year an now I’m hooked! When I heard that DirecTV was taking away National Geographic from their subscribers I was flabbergasted. I for one wouldn’t stand for it and although my DISH Network employee account assures me I’ll have FOX channels for years to come I bet DirecTV customers would like the same peace of mind. If I were in that situation I would switch ASAP so I don’t miss my favorite shows.